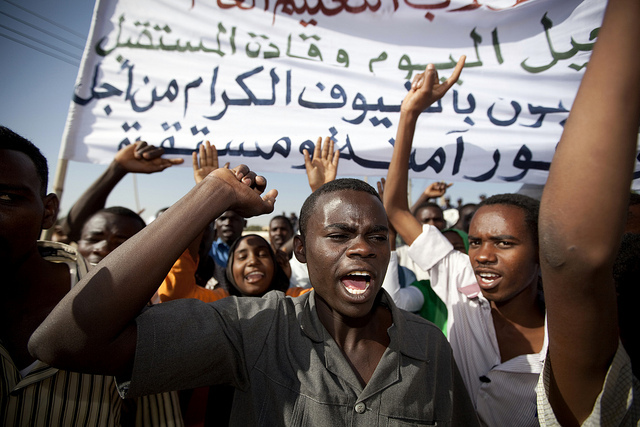 2010 protests outside University of Zalingei, West Darfur. African countries appear to be in the midst of an epic shift in the nature of their political struggles. The continent continues its long-term decline in violent conflicts with the total number this year falling to half of their post–Cold War peak. How do we make sense of this decline? One approach is to assume that African violence has become apolitical and even nihilistic in its form and content; hence it is no longer a space for legitimate political struggle. News accounts of the violence perpetrated by groups like the Lord’s Resistance Army, Boko Haram, Ansar Dine, or Al Shabaab, driven by transnational concerns and seemingly devoid of any viable national political agendas, bolster this claim. However, this approach does not tell us much about where African political energies are being expended. Perhaps African governments have simply become better at responding to the needs of their citizens, who no longer feel compelled to challenge their respective regimes? Unfortunately, parallel to the decline in violence, the continent has suffered a democratic setback over the past decade that challenges this assumption (the number of countries labeled “free” or “partially free” by Freedom House dropped to 30 from the pinnacle of 34 reached in 2005). A more nuanced reading of the drop in violence is that Africans have moved away from resolving their political issues with force. Instead, they are privileging other forms of non-violent political action, especially urban protests, which have witnessed an upsurge over the past decade. This approach treats urban protest as a substitute for rural violence. Scholarship largely accepts this binary, by analyzing each as a discrete and unrelated phenomenon. Indeed, scholars have long treated urban and rural political action as deserving of separate analytical categories, divided politically, economically and often ethnically. We have studied them as distinct spaces, partitioning the study of violent conflicts that often have disproportionate effects on rural areas from analyses of broader national political trends centered within capital cities. Conflict scholars, including me, have worked hard to understand these spaces of violence, often arguing that the capital city bias of much analysis renders these areas opaque—black spots immune to observation and analysis by outsiders. Eastern Congo, South Sudan and Darfur, Northern Nigeria, and Northern Uganda stand as prominent recent examples. On the other side, those focusing on national level phenomenon tend to cut zones of violence out of consideration, surgically excising these areas from infecting life in the surrounding national body. Yet such a division of scholarly labor ignores the complex ties between the largely urban protest movements and the primarily rural conflicts that continue to bedevil many of Africa’s largest countries. It is not just outsiders that are prone to such selective thinking. During the war in Uganda, I would often discuss the situation with Kampala-based colleagues and friends, many of whom were puzzled as to why I was interested in traveling to the north, an easy four-hour bus journey away. Life in Kampala seemed to continue unabated, despite the horror stories that would occasionally flash across the daily broadsheets. Much the same can be said about the view from Khartoum or Kinshasa, where the troubles in the periphery are treated as peripheral. But does such a partition of geographic space hold either intellectually or even politically? I believe not. Increasingly, we are witnessing a commingling of urban and rural agendas that force a reconsideration of our current approach to understanding the relationship between violence in the peripheries and popular movements in the cities. Urbanization is driving this blending by bringing what were once thought of as peripheral conflicts to the center of national politics, even if not always in a straightforward manner. Earlier waves of popular protests such as those that followed the end of the Cold War were often dismissed for espousing narrow agendas unrepresentative of an imagined, rural African public. Analysts claimed that the continent’s primarily rural composition rendered such movements tangential if not irrelevant. Even today, in the face of a dramatic migration into urban areas that has produced a population in which 40% are city dwellers (37% in sub-Saharan Africa according to a 2010 UN Habitat study, significantly higher than India), analysts dismiss the possibility of truly popular uprisings due to Africa’s rural bias. Driving this deepening relationship between urban and rural Africa are powerful economic logics tied to a global rise in commodity prices that has allowed many African governments to pivot away from their reliance on Western aid toward investment from Asian capitals. The effect is to inextricably tie the fate of rural Africa, the source of all those commodities, to the capital cities that process the transactions through which these goods enter global markets, reaping the bulk of the financial benefits in the process. The post-election crisis in Cote d’Ivoire stands as an important transition point between the post-Cold War wave of democratization protests in West Africa and the more recent iterations of this phenomenon. As with earlier conflicts that broke out across the continent in the 1990s, Cote d’Ivoire’s crisis was tied to the end of the Cold War and the demise of a long-ruling (relatively benign) dictator. A complex medley of ethnic and citizenship tensions undermined a dysfunctional democratic process triggering popular protests that eventually led to civil war. Though the war had clear spatial dimensions, with the opposition ensconced within its own sovereign space in the north and the government firmly in control of the south as per a 2003 peace agreement, the country could never isolate the violence to a specific area. Instead, the violence continued to dictate political and economic realities across the country until its denouement, a decisive second civil war in 2011. Recent popular movements across the continent have had a similarly interactive relationship with violent conflicts taking place in the periphery. For example, in Sudan, the 2012 death of four Darfuri students near Khartoum led to multiple days of protests by pro-democracy activists, revealing the complex relationship of the Darfur war to the “Girifna” (we are fed up) movement formed in 2009 by university students, among others. As a result of the 2011 peace deal between the Khartoum government and an alliance of Darfuri groups, the children of displaced Darfuris received a five-year fee waiver at national universities, literally bringing the problems of the periphery into the heart of the capital. Such an integrated analysis of the common forces driving African rural and urban realities is sorely lacking. While work has been done to explore the effect of Asian capitals across the continent, we have not fleshed out the domestic picture sufficiently. What is needed is a better sense of the ways in which the forces of globalization and urbanization are transforming the political, economic, and social conditions of contemporary African life, and what types of political action—whether rural or urban, violent or non-violent—are being produced in response. “Freedom in the World 2013: Democratic Breakthroughs in the Balance,” Freedom House, 2013, http://www.freedomhouse.org/report/freedom-world/freedom-world-2013; “Freedom in the World 2005,” Freedom House, 2005, http://www.freedomhouse.org/report/freedom-world/freedom-world-2005. Mao Kaci, “Boko Haram: Of the Sensible and the Insensible,” Nigerians Talk, September 20, 2011, http://nigerianstalk.org/2011/09/20/boko-haram-of-the-sensible-and-the-insensible/. UN Habitat, The State of African Cities 2010: Governance, Inequality and Urban Land Markets (Nairobi: UN Habitat, November 2010), ii, 172, http://www.unhabitat.org/pmss/listItemDetails.aspx?publicationID=3034. Jolyon Ford, “Democracy and Change: What are the Prospects for an “African Spring?,” African Futures, July 14, 2012, http://forums.ssrc.org/african-futures/2012/07/14/democracy-change-prospects-african-spring/. What is the relationship between violent rural and urban protest in Africa? Leaving the Arab North apart, it is noteworthy that despite massive urbanization, most violent protest movements have been rurally based. This “rural radicalism” goes back – in some instances, e.g. DRC – to the independence struggles. For a long time it was not given the attention it deserved, in my view, because of ideologically derived analysis. The left, inspired by Marxism, viewed rural populations as a drag on progressive protest. “Real” protest was expected if not from the hardly existing proletariat at least from the “awakened” urban masses. The right, in an odd way, agreed with this analysis by viewing urban protest movements as “infected” by contact with the European left and seeing rural masses as basically content. the rural population was often more aggressively opposed to the colonial system than the urban based party leaders. That was followed by the Congo Rebellions (1963-8) that were very violent and very much based on rural masses. During this entire period, there was hardly a peep out of the main urban centers with the exception of those cities – e.g. Stanleyville/Kisangani – that had been captured by the rurally based revolutionary movement. to today. During the period when the DRC was divided between Kinshasa and “rebel” controlled areas i.e. during the Second Congo War (1998-2003), violent conflict between the two sides quickly resulted in a stalemate but violence internally in the East AGAINST the “rebel” administrations (RCD/Goma, RCD/ML) covering one third of the country, grew to disastrous proportions. Here, as during the 60’s Congo Rebellions, urban centers remained under the effective control of the dominant authority, but the rural areas became endless war zones costing the lives of millions of Congolese citizens. is my friend. So, Kinshasa supported with arms, ammunition etc. the Mai Mai groups (allied to the Rwandan Hutu FDLR) that fought the Rwandan backed RCD/Goma etc. But this was opportunistic state policy not any sort of popular protest. decade long violence in the northwest. In Nigeria, no Cairo in Lagos, but now violence led by Boko Haram, etc. etc. What can we conclude from this? First, that modern control mechanisms allow governments (or de facto urban administrations) to control urban populations more easily than in the past. Second, many African governments have neglected the basic interests of their rural citizens and at the same time have allowed for a decline in the quality of rural administration. In turn, this produces protest and a lowering of the ability to control it. Third, to the degree that rural protest movements have structured leadership, they often have their eye on the capital city and want a piece of the action there. But, such movements rarely have the institutional structure and internal discipline to either attain the sought after influence and power or to avoid their representatives being assimilated into and bought off by the existing capital city elite. Rural masses, even if they fight for their interests, tend to lose out in the end.